Native tidal wetland plant communities appear to be stable in the project area. The spatial extent of tidal wetlands is also relatively stable but could be improved- there are degraded tidal and non-tidal wetlands remaining in key locations that could be enhanced to improve juvenile salmon habitat. A key local information gap is not knowing whether sea level rise will outpace local tidal marsh vertical accretion rates; to what extent, if any, local tidal marshes will need to migrate landward in the future. The rich abundance of vegetation produced by tidal wetlands forms the base of the estuarine food web which supports an astounding variety of animal species. Tidal wetlands also process nutrients, stabilize sediments, improve water quality, and protect coastlines from storm damage; tidal wetland channels provide refuge and forage for many fish and shellfish species, including juvenile salmon and juvenile Dungeness crab. Because of a series of tidal wetland restoration projects initiated between 1996 and 2003 which converted former tidal wetlands that had been historically converted to agricultural uses back to functional tidal wetlands, South Slough Reserve staff has been tracking the status of tidal wetlands in the South Slough estuary for many years. Two sites in particular have been the focus of a variety of data collection: Danger Point Marsh and Tom’s Creek Marsh. Both sites were used starting in 1995 as reference sites for restoration project planning and evaluation because neither site had been historically converted fully to agricultural uses. Those two sites are prime examples of how fully restored tidal wetland restoration sites in the upper South Slough estuary should look and behave. We have collected data from other tidal wetlands in the South Slough estuary over shorter time periods, including seven additional tidal wetland sites from which Reserve staff began collecting vegetation, vertical accretion, and marsh elevation data in 2010 (groundwater level to be added in 2012 or the during the project’s next funding cycle). That project, funded by the National Estuarine Research Reserve System, is designed to track the status of relatively undisturbed tidal wetlands in the South Slough estuary to characterize the local effects of climate change on tidal wetland structure and function. Interpreting data from the tidal wetland plant communities for which we have long term information, it appears that percent frequency of the dominant marsh plant species (percent of plots in which individual species are encountered) appear to be stable (Figure 1). See Figure 2 for a comparison with a plant community in the early stages of development (from the Kunz Marsh restoration project). Likewise for species richness (average number of plant species found in each monitoring plot), the trend over the past 10 or more years suggests stability. 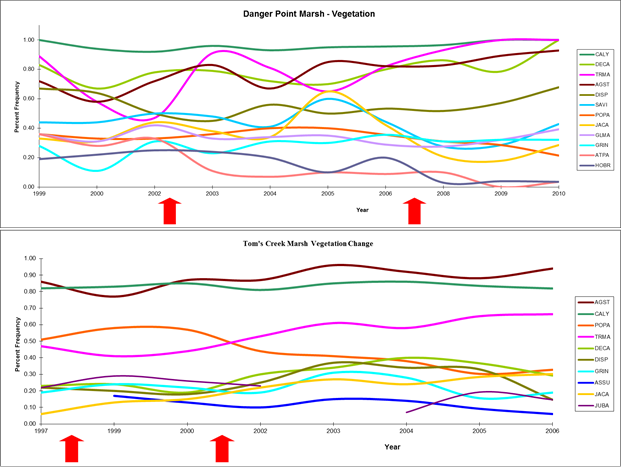 However it appears we need more data to understand whether the slight downward trend at Tom’s Creek marsh is continuing. The additional plant survey work done by Reserve staff has generally supported the feeling that there are no major, permanent changes taking place in the tidal wetland plant communities in South Slough- especially the salt and brackish marsh communities. The biggest threat would likely be from invasive exotic salt-tolerant species, but fortunately there are no invasive exotic plant species that currently threaten salt and brackish marshes here. Several years ago two large patches of smooth cordgrass (Spartina alterniflora), a very invasive exotic salt marsh plant common on the east coast (and a problem in some California and Washington estuaries), were found in a marsh at the mouth of the South Slough. These plants were entirely removed by a South Slough Reserve-led youth crew and checked each year after removal for evidence of re-growth. No re-growth has ever been found, largely due to the lucky fact that none of the plants had formed seed heads, so the plants never contributed any seeds to the marsh seed bank. Freshwater tidal wetlands are a different story. In the upper estuary, undisturbed tidal freshwater marshes are generally dominated by healthy stands of native herbaceous and woody vegetation. But in some areas with a history of human disturbance, it’s relatively common for parts of the plant community to be dominated by invasive non-native plants including reed canary grass, Himalayan blackberry, bull and Canadian thistle and bird’s foot trefoil. There are other non-native plants in the plant community but these species tend to dominate while the other non-native plants become non-dominant parts of the plant community. Even in some undisturbed areas, non-native plants can be found most likely imported there as seeds on the hooves of deer or elk, or dropped by birds, or on the boots of hikers or field biologists(!). It’s worth noting that there is one salt marsh plant species listed here as a species of concern by the U.S. 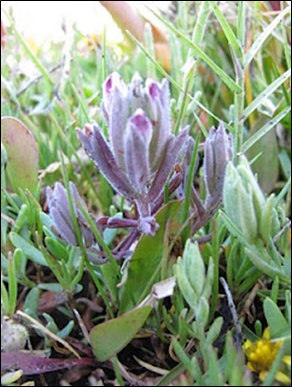 Fish and Wildlife Service, and as endangered by the state of Oregon: salt marsh bird’s beak (Cordylanthus maritimus ssp. palustris)(Figure 4). South Slough reserve staff work with various partners to keep track of the general location of the plant which tends to grow in the lower estuary in sandy soils among plants like pickleweed and fleshy jaumea. Tidal wetlands have also been mapped and classified (wetland type identified) in the project area by the U.S. 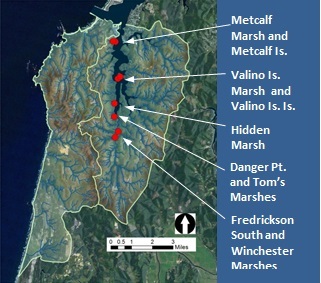 Fish and Wildlife Service (USFWS 2011) and within the South Slough Reserve by Reserve staff (Figure 5). The spatial extent of local tidal wetlands is being tracked to understand which wetland types may be under (or over) -represented relative to historic conditions to help prioritize wetland restoration and mitigation planning. For example, it’s well understood that tidal swamps (scrub-shrub and forested wetlands) currently make up a very small fraction of the wetland area they historically occupied in Oregon (and Pacific Northwest) estuaries (e.g., Brophy and So 2005). A historic analysis of wetland type has not yet been conducted for the South Slough and Coastal Frontal watersheds or the Coos estuary. Mapping also helps us quantify and characterize the legacy of past and current land uses, as well as local changes attributable to the effects of climate change. 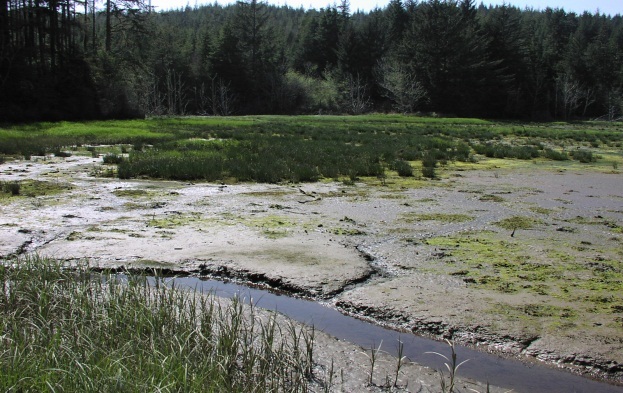 For example, Reserve staff and local natural resource managers have identified additional former tidal and non-tidal wetlands in the upper South Slough estuary that could be restored to full tidal wetland structure and function. 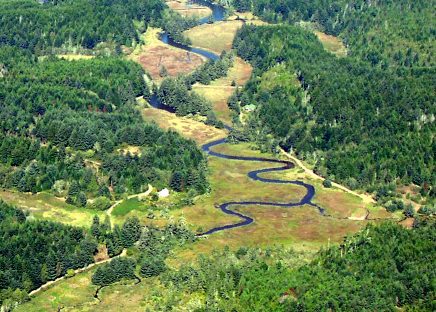 Re-establishing tidal channel complexity and native vegetation cover in those former wetland areas would be beneficial to juvenile salmonids (juvenile coho salmon in particular) needing to use those channels for overwintering and summer refuge. A discussion of the likely effects of sea level rise on tidal wetlands appears in the companion data summary, Local Tide Heights in the Partnership for Coastal Watersheds Area. Brophy, L.S. and K. So. 2005. 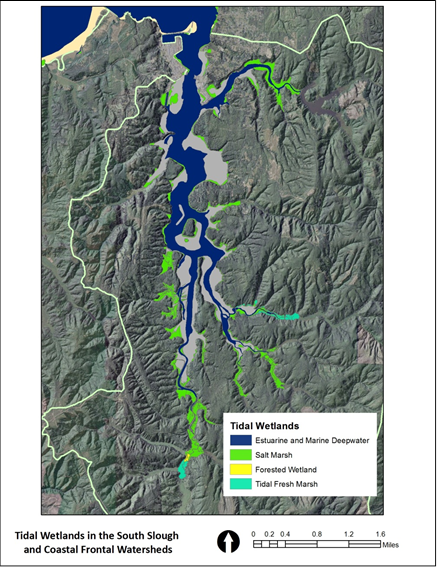 Tidal Wetland Prioritization for the Smith River Watershed, Umpqua River Estuary of Oregon. Prepared for the U.S. Fish and Wildlife Service, Oregon Coastal Program, Newport Field Office.